This was a little project I came up with to put our collection of wine corks to some use. I found a cork board on clearance at Marshalls for $5- thus the animal motif - and simply hot glued corks onto it, using champagne corks to form a ledge along the bottom. This makes for a novel bulletin board ! What a cute idea. I love using old corks in projects. I once covered a whole table in them. Your bulletin board looks great. Thanks for sharing. Cute idea! I like the ledge, too! What a great idea. Goggle is hiding the picture but I get the idea. I think one covered in corks all over would be cool too, it would take a ton of corks though. I am working my way through all my old followers and going back and forth between the old blog and the new one so forgive me if you have already signed up to refollow me. If you haven't please resign up. I am not allowed to take my followers with me when I moved my blog to my own site, so to get my updates in your reader you need to re-sign up. Have you checked out my give-a-way for this week? I posted it on Friday. Thanks for posting to the party. I am just about done with all of the things involved with the move and I get get back to all the fun blog stuff-visits and crafts. I definitely want to read more soon. BTW, rather good design you have at this site, but don’t you think it should be changed once in a few months? this is such a great idea, I've seen this before and I love it!! What a cute idea! And cork is so popular nowadays, at least, it seems to be. I love this idea! Nice way to use up your wine corks! Really cool idea -- I love cork projects. You have now given me an idea for a new one. Hi I'm subscribed for mailbox monday! Way cute! It came out great. I love it! Very cute idea. I'm following you from the Tuesday blog hop. I'm looking forward to getting updates on your blog. I would love a follow back. Have a great day! Oh this is amazing. I love it. It makes a standard bulletin board look mundane. Now I need to start drinking more. Thank you so much for sharing this on the Boardwalk Bragfest. It's a wonderful project! Happy Tacklin' Tuesday! I love that board! Great job! Even more I love your header! Very bright. Oooo, I was just offered a large quantity of wine corks. You got my brain working, thanks!! love it, looks great. i wish i had saved all of mine, i've started to now. i'm putting them in an apothecary jar. What a great idea! That is a great way to reduce, reuse, and recycle. And I see people giving away lots of corks all the time on Freecycle. I hope you'll stop by and visit over at Free 2 Be Frugal sometime soon. This is a great idea for old wine corks. I am going to send this to my sister who has a huge collection of wine corks and nothing to do with them. Thanks so much for joining me at Gifts From the Heart Linky Party. I hope to see you next month on the 20th! 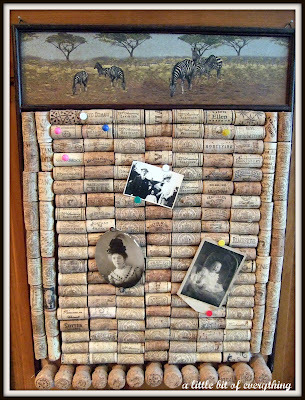 I've been wanting to make one of these wine cork bulletin boards - yours turned out great! I love this and the vintage images you used to photograph the project. Super cute. I have all my corks in an apothecary jar on top of our fridge. I try to write a note with a sharpee on each, especially if it was a special occassion. Nice to meet you! What a great idea! Good crafty Christmas gifts, too! I've also seen corks in frames to be used as pot holders. We save every cork from every wine bottle we open and so I have a ridiculous number of corks in vases and lying around in other random places. I haven't used any of them in crafts yet, but I will...someday. 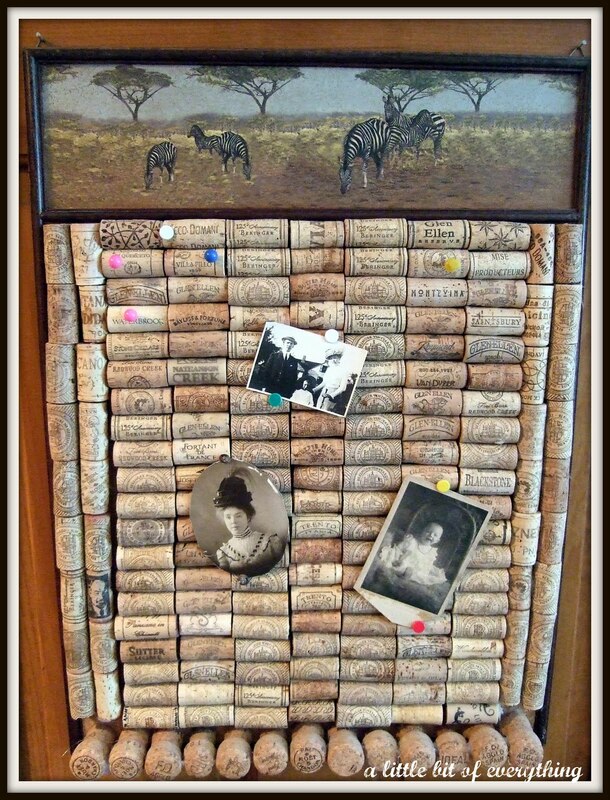 This looks very similar to a wine cork board I helped a lady make - minus the animal motif lol. I just found you blog from Simply Sweet Home Fridays. I'll have to give this a try for my mom. This would be a great gift. What a fun cork board! Thanks for linking up to Topsy Turvy Tuesday!